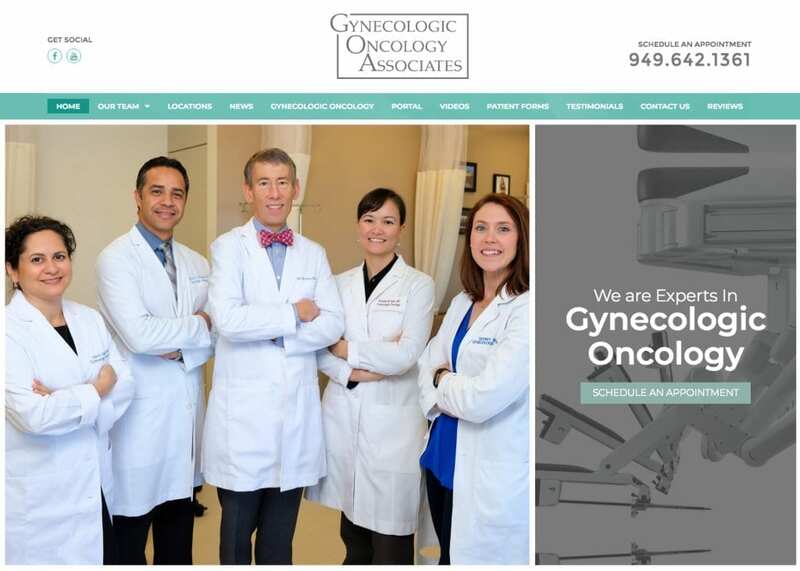 Gynecologic Oncology Associates deal with some of the most challenging cases doctors can face, and they wanted a site that would instill comfort and confidence in their visitors. We understood the importance of the work they were doing and the role their website would play in it, so we put together a site that provided solid information, clean navigation, and a sense of professionalism to help bolster the visitor’s hope. We knew that the happy, confident faces of the staff who work at this office were the first things that visitors needed to see. The confidence and dedication to their patients shine from their faces, and immediately starts the work of setting their visitors at ease. We moved on from there to provide information about their qualifications and their clientele, helping to bolster their reputation and set the viewer at ease. Every part of this site focuses on building a personal relationship between the staff at this facility and the viewer, to ensure that they’re already at ease when they arrive. Blue is a prominent color in the design of this site due to its welcoming influence, as well as a sense of calm and peace. White is a neutral color commonly used in our medical site designs and is associated with cleanliness and purity as well as authority. Grey serves as another calming element but also gives the site a conservative and formal feel when, combined with the other elements of the site, helps complete the impression of a welcoming staff who knows their business. • Contrast – Blue, grey, and white all contrast each other in an attractive and gentle way avoiding stark borders and instead of serving to blend the appearance of the site together well. • Action Oriented – Blue is used to draw customers eyes to important parts of the site, from their contact information to the buttons on their appointment forms. Grey is occasionally used alongside the blue when more than one point of action is called for. While having a site that’s packed full of information is fantastic, the presentation is everything. The overall design of this site incorporates some basic concepts that help ensure that the result is effective and attractive. • Space – The use of space on this site is well organized, with text and imagery balanced against each other to create an attractive and free-flowing experience. • Navigation – Getting around this site is a breeze, with quick access to any point of the site available through the hamburger menu found at the top of the screen. Throughout the site, information is provided and links that extend to further points of interest, while the hamburger menu remains ever-present. • About Us – This site’s design relies heavily on introducing the customer to the staff and the people who will be helping them through this trying time of their life. In Lieu of an About Us page this site provides links to profiles for each of the doctors working at the site, as well as information about their office staff. Even for medical sites conversion is an important aspect that needs to be considered. If patients visit your site but aren’t compelled to contact your facility, you won’t be able to aid them with your services. Conversion is defined as when a visitor to a site takes action to become a client or patient. • Compact Information Forms – Collecting information from your potential clients is important, but it’s important to ensure that the forms can be filled out quickly and efficiently. Long forms give the visitor an opportunity to change their minds. • Videos – Videos bring a certain living element to the site, humanizing the images of the doctors and facility. When used properly videos can play a huge role in making patients feel confident about the services the site offers and can drive them to convert. This site provides the appearance of a very person oriented facility that humanizes the patient and treats them like a person rather than a disease. Throughout the site, you get to meet the doctors and staff, as well as gather more information about the treatments and services available throughout. It’s colored to provide a clean palette that’s easy on the eyes and pleasant to interact with.